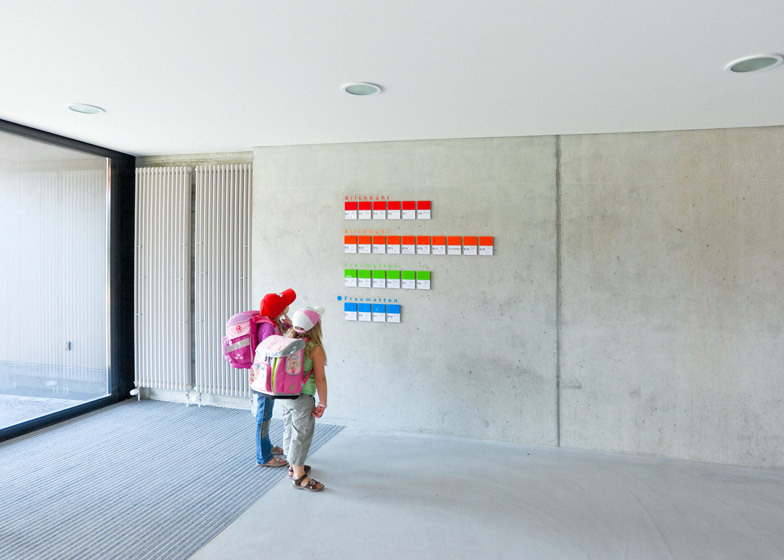 Internal lighting shines between the vertical larch battens that clad this extension to a primary school near Basel by Swiss firms Zwimpfer Partner Architekten and BBK Architekten. 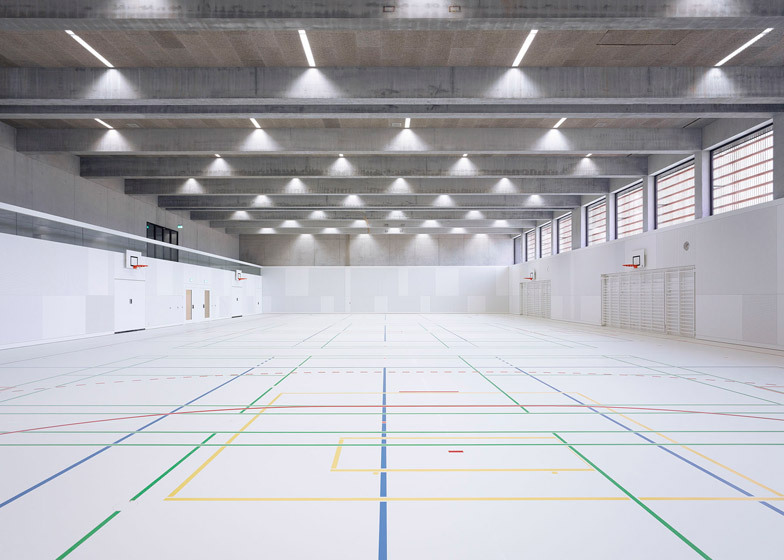 Situated in the centre of the village of Biel-Benken, the facility by Zwimpfer Partner Architekten and BBK Architekten adds to the original buildings at Kilchbühl school, which date from 1964. It comprises two interconnected wings containing teaching facilities and a gym hall that fill a vacant plot between the existing buildings and a new village square at the other end of the site. The schoolhouse section was completed last year and was joined more recently by the perpendicular gym hall, forming a sheltered outdoor space between the L-shaped exterior and the original school. 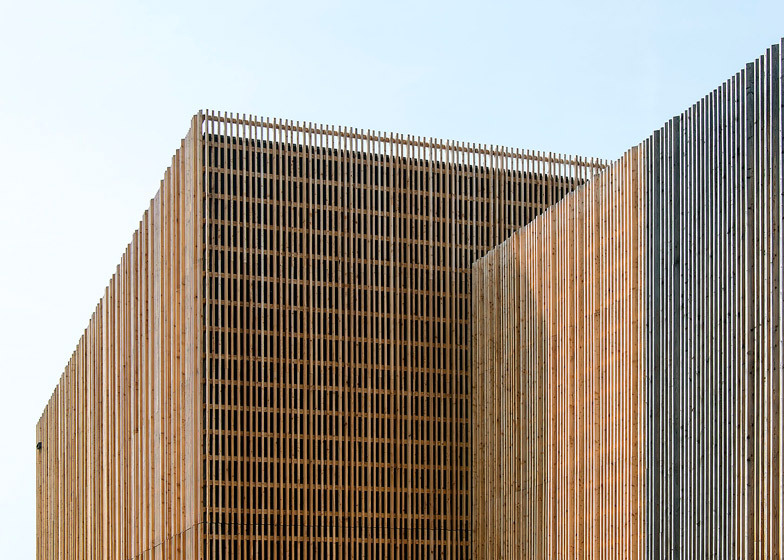 Both sections of the building feature concrete cores wrapped entirely in battens of untreated local larch with different depths, which create a pattern across the facades that alters when viewed from different angles. 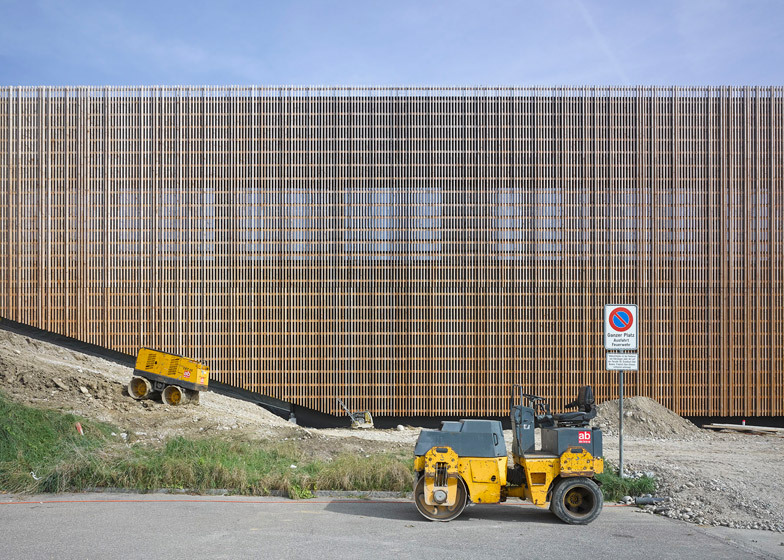 "A rhythmic sequence of larch wood panels leads the eye along the exterior walls," said the architects. 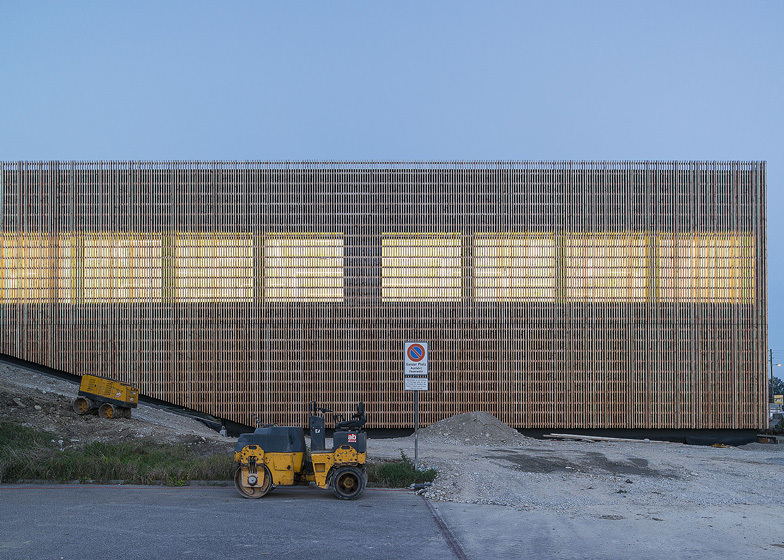 The wooden cladding covers high window openings on the west-facing wall of the gym hall to limit the amount of direct sunlight entering the building. 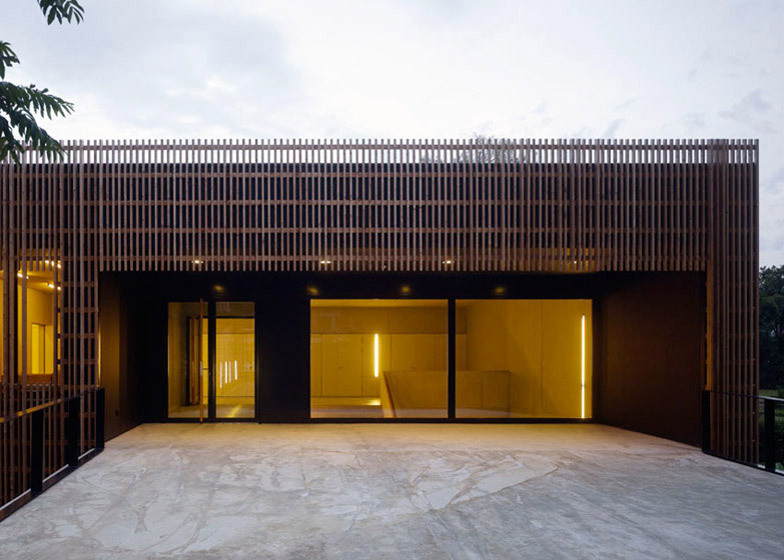 "Interacting with the inner space of the building the wooden facade stays tangible in every room and influences the atmosphere by reflecting and filtering the sunlight," said the team. 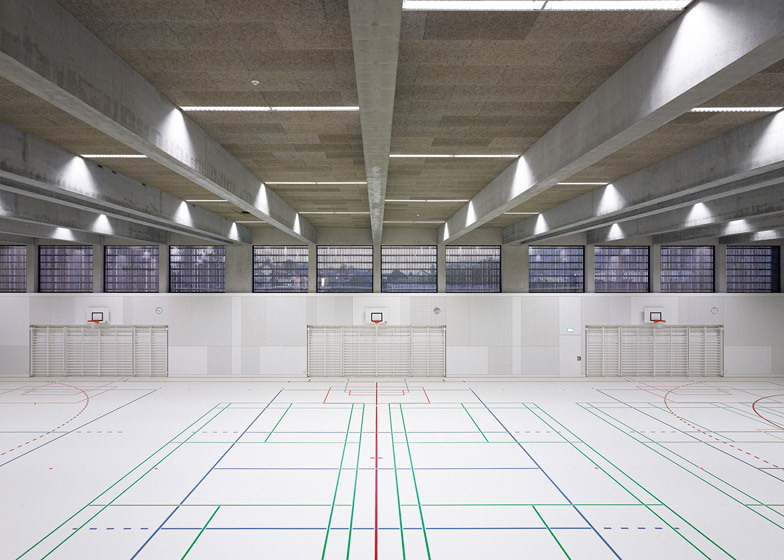 The gymnasium burrows into a sloping section of the site and features exposed concrete beams supporting the large span of its ceiling. Daylight entering the hall through clerestory windows is supplemented by strip lighting between the ceiling beams. 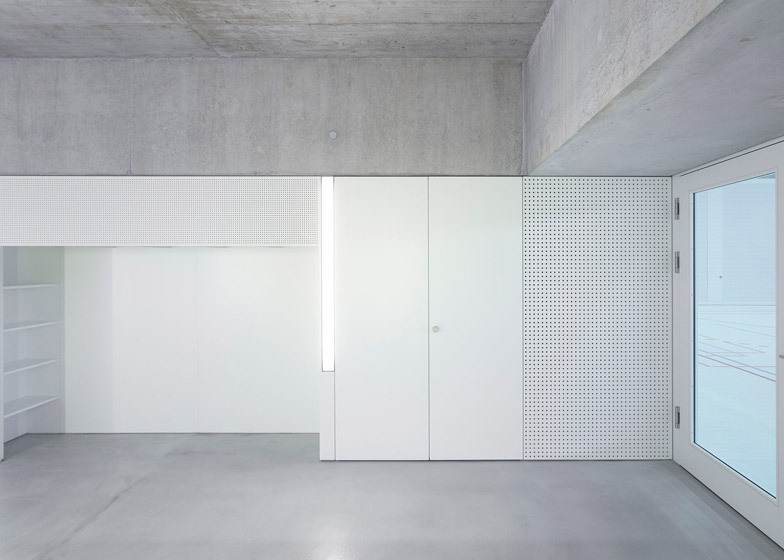 Walls are painted white and the open space can be configured in various ways. 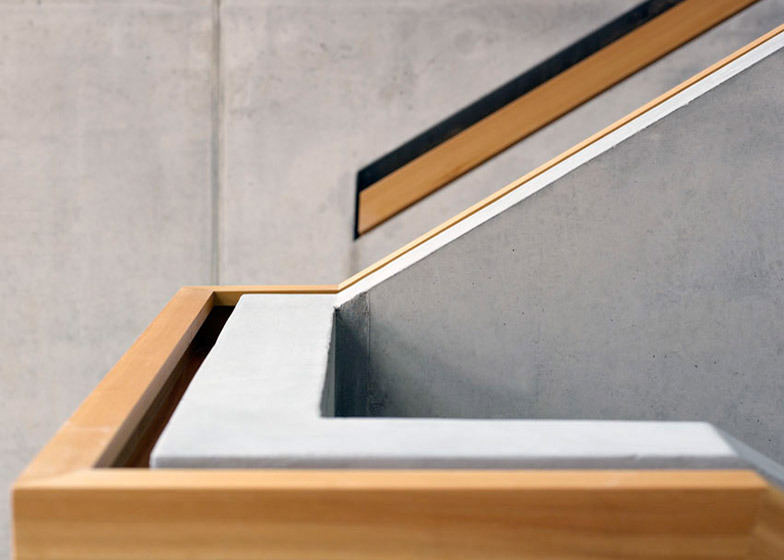 At the highest part of the plot, a concrete ramp connects the older part of the school to an entrance on the upper floor of the two-storey teaching building. This level houses the classrooms and adjoining groupwork rooms, while additional work spaces, storage and technical facilities are located on the lower storey. 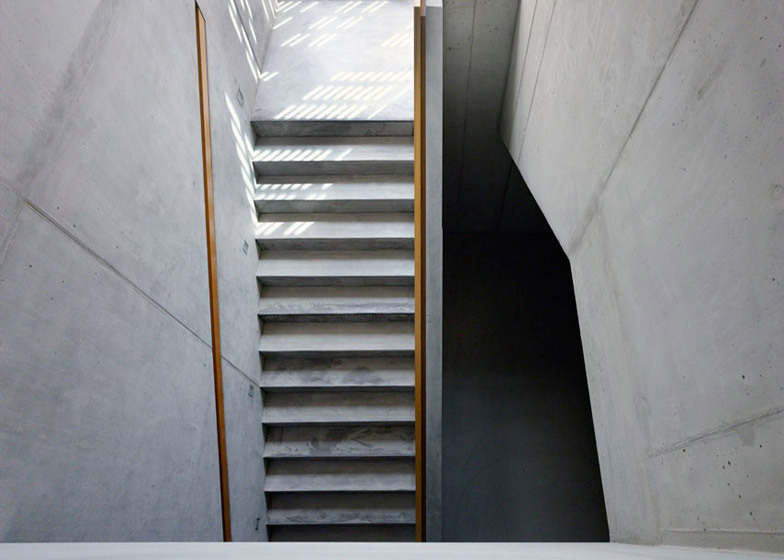 Dappled light filtering through the timber screens illuminates the stairwells connecting the two levels, which feature wooden handrails set into the concrete walls. 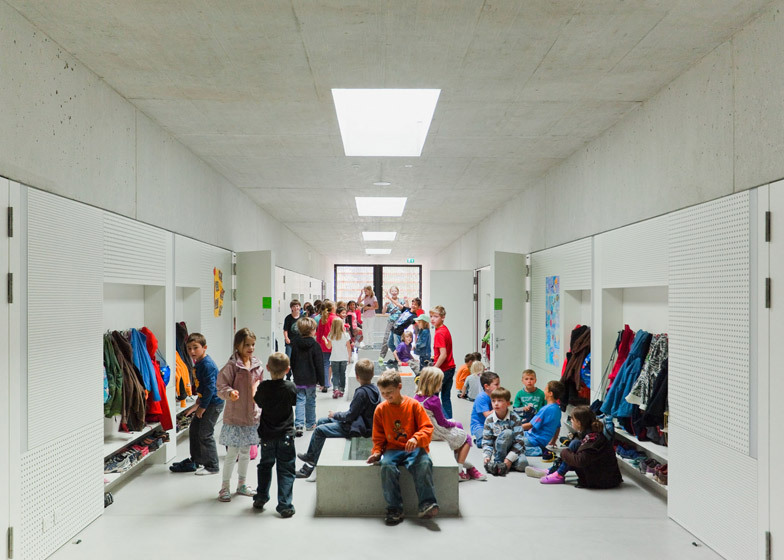 A long corridor that bisects the school building on the ground floor contains low-level concrete benches and storage integrated into white fitted cabinetry so the space can be used as a cloakroom. Photography is by Johannes Marburg and Eik Frenzel.